ABS Woods is proud to offer the revolutionary Vanish Decking System. Vanish utilizes a decking profile that completely conceals the fasteners. Now you can bring your inside flooring look to outdoor spaces. We are excited to bring this new profile to your home. Stronger: Vanish fasteners are made from Stainless Steel. More Flexible: When it comes to Exterior home design, Vanish has no limits. You now can bring the sophisticated elegance of natural hardwood to terraces, pool decks, gardens, walkways, open-air kitchens and other outdoor living spaces. Decking: Only 5/4 boards (5/4×6 or 5/4×4) boards are eligible for the Vanish profile. Fasteners: The Vanish Decking System Fasteners are made from coated stainless steel, and are up to 3 times stronger than traditional plastic clips. In addition, the prevent rusting to further extend the life of your deck. 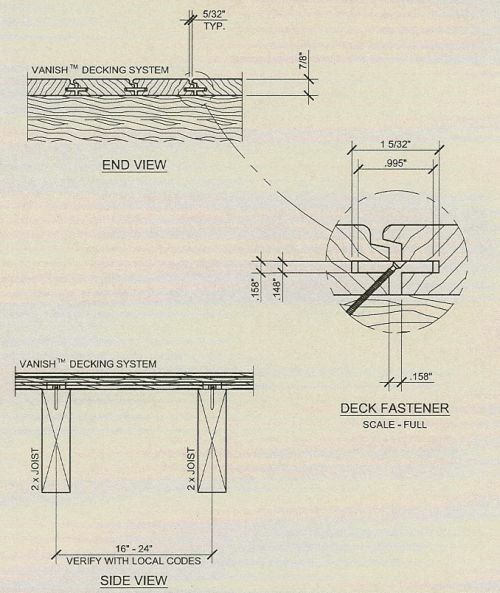 Alignment: Vanish Decking Systems fasteners are designed to allow for contraction and expansion while keeping the decking in alignment. This ensures unparalleled strength, stability, and beauty. Profile: The vanish decking System utilizes a clip-eclipsing wood profile that completely conceals the fasteners system while still allowing water to drain. This profile also makes certain that small objects such as earrings or coins will not fall through the decking. Summary: With no gaps or screws to detract from teh rich natural beauty of Iron Wood hardwood or to possible cause unwanted cracks and splinters, it’s clear that no decking solution available on the market today is more appealing to the eye or gentler on the bare feet than the Vanish Decking System.